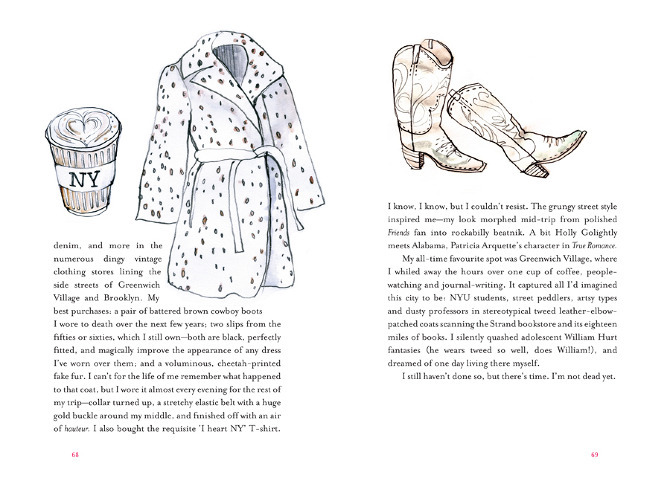 If you’ve read A Life in Frocks, you’ll know I was lucky enough to have illustrations done by the talented Zoe Sadokierski and an unusual layout (Frocks won an Australian Publisher’s Association Award: Best-Designed Non-Fiction Book, 2010). Even in an age of digital publishing and e-readers, I still believe the book is a beautiful object people want to have and to hold. 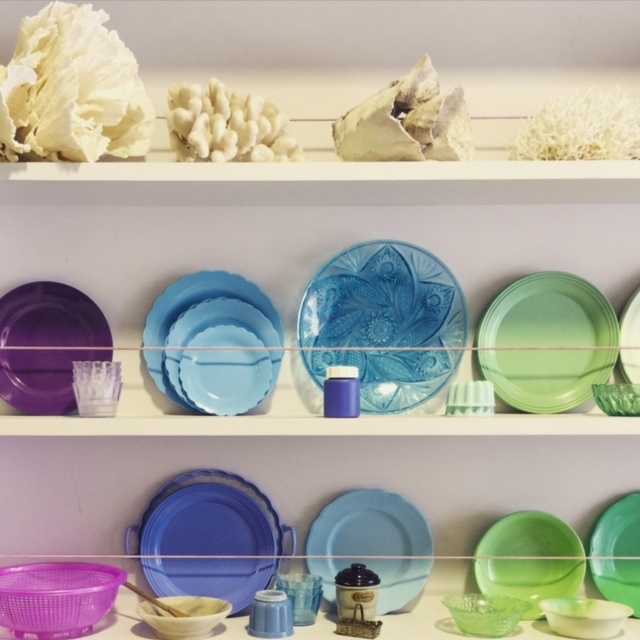 Such covetable objects will always exist, even in a rarefied form (we hope)! “When I completed my tax return last year, the closest description I could find for my occupation was ‘furniture packer.’ And in fact, this is pretty accurate. If by furniture you include engraved silver cutlery, hand-dyed fabrics of every size and colour, any patterned cup or saucer you please or old French glass essence jars still faintly smelling of cinnamon. 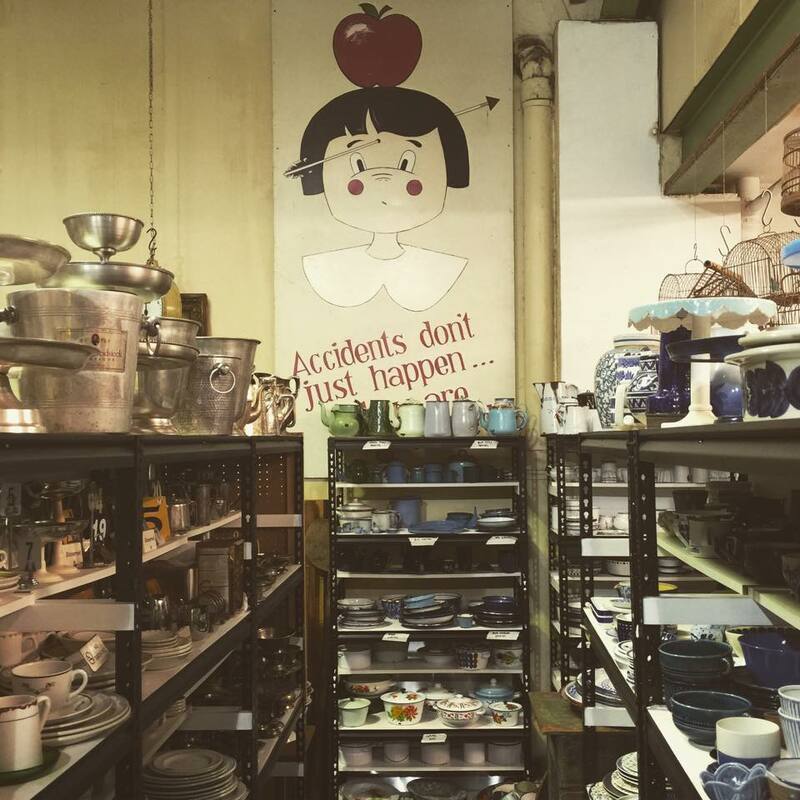 These are the items that are stacked to the ceiling of my workplace, and I will pack, unpack and restack them each day in the trove of kitchenware and vintage treasures that fills Major & Tom. 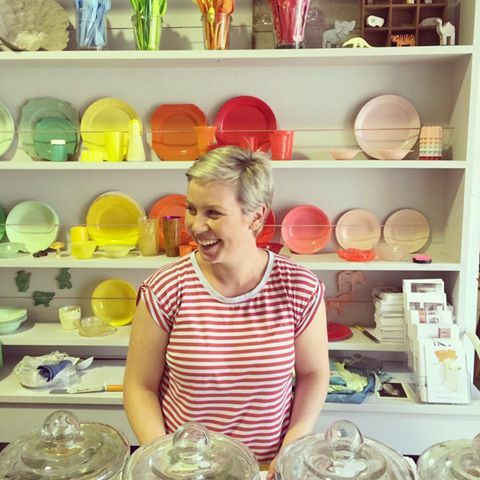 Behind the aisles of plates and jugs is Georgie, diviner of beautiful old bowls, creator of moody canvases and restorer of French dining tables. 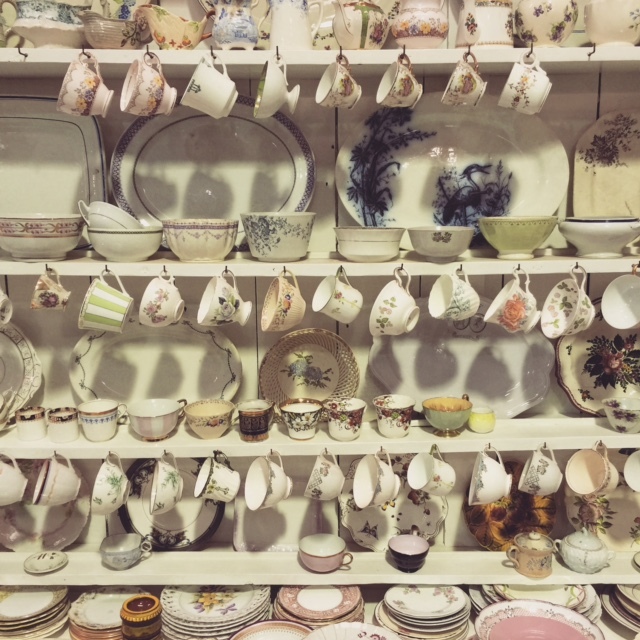 From her workshop filled with beeswax and paint, Georgie has created a warehouse from which food stylists and art directors can pluck just the right teapot for their roaring twenties-themed film set, or source a worn timber tabletop for the next issue of Gourmet Traveller. Travelling from Paris to Adelaide to Rozelle markets to find worn English biscuit tins and the latest in Danish design, Georgie’s eye is unparalleled. Her warehouse is an evolving display of possibilities for a stylist’s next brief. Armed with such a brief, stylists pop in to Major & Tom and will often settle in for the day. They will set their bag and laptop on the long pine table that runs the length of the warehouse, and – if they are in at the right moment – will be offered a cup of tea to ease them into the hunt. First off, the wall of tabletops and surfaces is scoured, with questions like colour, texture and budget determining whether to choose a crackled teal cypress or a bright white oregan. Once the background and surface has been matched to the brief, the stylist will look at each recipe and shot in order to determine whether specific items are needed, like a cakestand or casserole dish, and what mood is to be achieved. It is here that the magic happens. I have a lot of admiration for stylists, who have to interpret the ideas of the art and marketing teams into a beautiful image that pleases everyone and looks delicious. Instagram filters may help me to jazz up last night’s bowl of soup, but after watching food stylists in action, I can assure you it is always going to look better when left to the professionals. Surrounded by these beautiful things every day, I am very happy to call myself a furniture packer. Each day brings different stylists working on a huge range of interesting creative projects. As they peruse our colour-coded aisles, I am admiring their selections and learning the nuances of design briefs and shot lists, not to mention getting a glimpse of upcoming recipes in my favourite food magazines. As a student learning about publishing, I am extremely lucky to be able to quiz freelance stylists about how the industry operates, as well as having the opportunity to meet such talented creative people living in my own city. The more I learn about the industry, and the more lovely and passionate stylists I meet, the more excited I am about the future of food styling and photography, no matter what the medium.